Agriculture and its allied activities engages 70% of the Indian population and contributes to roughly 18% of the Indian Gross Domestic Product. 46 out of 60 soil types and 20 agro-climatic regions exist in India. Compared to the world average of 11%, India has 52% cultivable land spread across 1.84 million sq.km (more than that of China, USA, Japan). Indian agriculture is wide spread with leading contributors in many areas. Production of food grains during 2011-12 is estimated at an all time record level of 250.42 MMT which is a significant achievement mainly due to increase in the production of rice and wheat. India is among 15 leading exporters of agricultural products with a 1.7% share of world trade in agriculture in 2010. With an export of USD 23.2 billion, India is expected to account for 5% of the world's agriculture exports by 2014. The nation has emerged as world's top rice exporter overtaking traditional leaders, Vietnam and Thailand. Increase in population and potential export market will remain the key drivers of the growth in this sector. Gujarat tops the agriculture growth table in the country with a CAGR of 10.7% over the last decade. 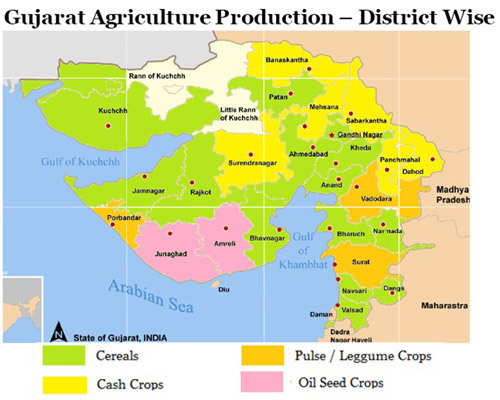 Around 65% of the total geographical area of 196 lakh hectares in Gujarat is cropped. The state has seven agro-climatic zones and wide varieties of soil. The production of total food grains witnessed ahigh growth, with a production of 10.1 MMT during 2010-11, as compared to 5.6 MMT in 2009-10. The state is also a leading contributor in the cotton production and accounts for 31% of production in the country. The production of cotton during 2010-11 is at 9.8 million bales as against 7.4 million bales in 2009-10. GLPC is involved in promotion of livelihood in the agriculture sector by providing technical and financial assistance to the beneficiaries through various Central and State level schemes. GLPC has assisted around 20,000 beneficiaries in the agriculture sector including seed production, organic farming, homestead model of crop cultivation and projects on system of root intensification. GLPC promoted the program titled "Maru Khetar Kare Saat Vakhat Vavetar" focusing on practice of multi crop production in an acre of land, through an integrated low cost sustainable agriculture multitier practices. Extensive training was provided to around 7,094 enrolled farmers in the areas including crop rotation, soil nutrient management and non-pesticide management (NPM). The program benefitted the farmers in increasing their farm productivity and their existing crop variety up to 7 crops with an estimated additional income of INR 4000 - 12000 per month.